One reason many people give for attending a prestigious or ranked college or university is the need to be among intellectual peers. Parents and students worry that students won’t be challenged enough at less-well known or lower ranked schools. This is often accompanied by the networking argument–it’s the class peers along with faculty that will be crucial in developing future opportunities. So for those who believe this is a serious concern, I suggest looking at colleges with Phi Beta Kappa chapters. The Phi Beta Kappa Society is the nation’s oldest academic honor society and includes the nation’s most selective and prestigious universities. In fact, very few of those schools that show up in the top 50 of US News nationally ranked universities and liberal arts colleges don’t have a chapter. What’s the big deal about this honor society as oppose to some of the others listed in the Association of College Honor Societies? Well, to begin with, it’s not a member so there must be some sort of exclusivity attitude at work that prestige chasers should find appealing. 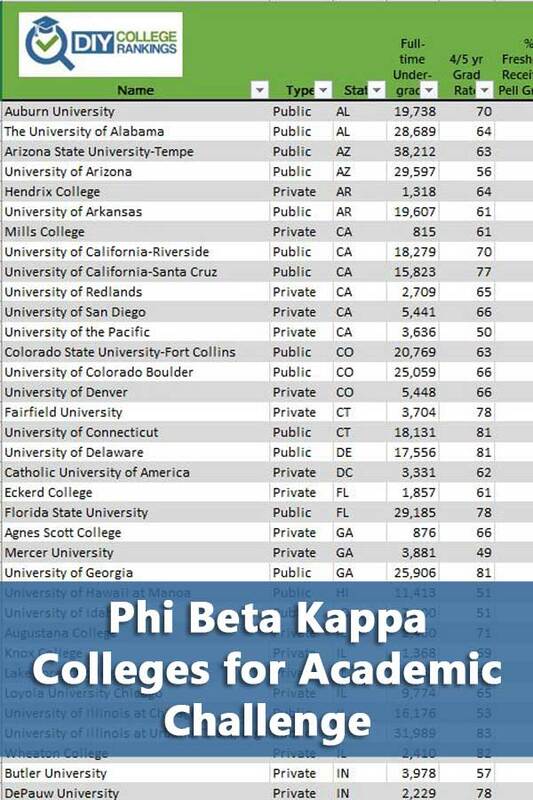 Adding to the exclusivity appeal is that fact that there are only 286 colleges with Phi Beta Kappa chapters nationally. Does Phi Beta Kappa Indicate Academic Challenge? What can I say, this is tricky territory. We’re talking about intangibles of networking which brings up reputation and then there’s the issue of whether or not it’s deserved but who cares as long as it provides the connections? According to Phi Beta Kappa, its members include 17 Presidents, 40 Supreme Court Justices, and 140 plus Nobel Laureates. If we assume that the reputation is well-deserved, then there are reasons to give special consideration to schools with Phi Beta Kappa chapter. To form a chapter, at least 10 percent of the full-time arts and science faculty must be Phi Beta Kappa members. This group is serious about creating and maintaining a core of members that will provide mentoring and networking opportunities for its student members. It also means that the school thinks it’s a worthwhile opportunity since the application fee is $2,000 and the examination fee is $12,000. Yeah, that’s a little more than the fees required to establish most college honor societies. This amount rivals and may exceed what it costs a college to receive general accreditation. If you think having a Phi Beta Kappa chapter is a worthy distinction, then you should know that at the time of this post, of the 286 chapters, 134 are 50-50 schools. That’s close to half of all chapters. Among the 134, 33 are some version of test optional. The schools are fairly evenly distributed between public and private and can be found in 46 states. Ohio has the most with 10 followed by Virginia with 8 and Illinois with 7. There are nine states with 5 or more schools with chapters. The following table lists 50-50 schools with chapters. As usual, the four-year graduation rate is used for private institutions and the five-year rate for public.